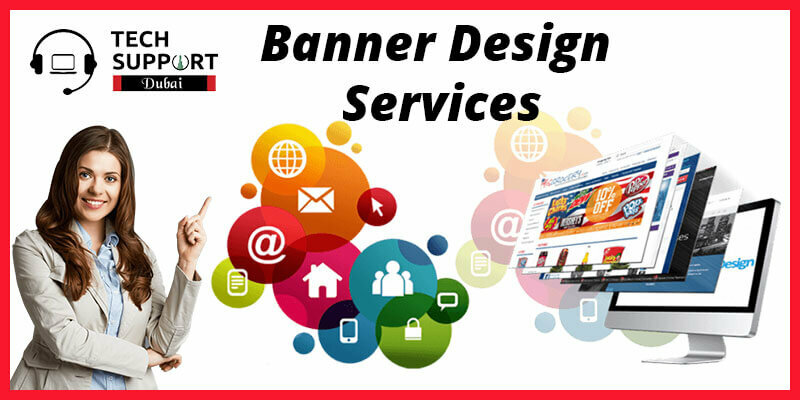 Banners are known as graphical web designing unit. The ideal banner measure units are 468×60, which means they are 468 pixels wide and 60 pixels long. Banner designs are dominating the digital marketing and advertising sector and are widening the scope of branding. They are small in size with rectangular shapes and are seen on various types of web pages. Their looks can vary along with content and theme. Banners are becoming one of the major components of the World Wide Web and are increasing the curiosity of the people landing on the page. Banners are the single source which drives the internet based marketing at a very fast speed and offers you with a globalised podium to exhibit your product to the world.The graphics content on banners are similar to the advertisements that are posted on hoardings and printed publications. If you happen to search for Banner Design Services, your requirements will be fulfilled here with us at Tech Support Dubai. Banner designs have the ultimate capacity to change a simple viewer into a potential customer. You can imagine how important banner designs are for marketing your products. Here, we provide you with a pool of services which will make your banner designs the most creative and smart among the lot. Let us have a look at our services and why we call ourselves the provider of the best Banner Design Services in Dubai. Firstly, we provide best skills for animation. It is the most important tool for banner design. It requires careful creation for the purpose of attracting attention of the probable consumers. We also keep in mind that the designs should not clash with the webpage we are advertising on. This gives us a view that our banner designs are distinct from each other. We avoid creating animation loop and focus on the main message that we are exhibiting. Secondly, we make use of bright colors. To draw the attention of the people, using bright colors is the most appreciated method. Thirdly, we keep the banner messages short. Our skilled designers know the art of maintaining the importance of the message along with animation and colors. Fourth, we make optimum usage of the designs so that it neither becomes boring or repetitive. Our professional team is well equipped with the knowledge and are known for keeping pace with new trends and requirements. We provide unmatched services when it comes to banner designing. Our experts are capable of dealing with critical demands and crucial situations along with maintaining the quality of services throughout the time. With pocket-friendly rates, our experts are gaining high popularity in the market. We provide scalable and cutting edge technologies that can improve the quality of the banner designs. To beat the competition, all you need is the most reliable Banner Design Company in Dubai to stand out from the others. To make it convenient for communicating with us, we have devised multiple modes. You can call us at our helpline number: 042053349 and talk to the design executives and share your queries. If you want, you can ditch the traditional way of calling and utilise the Live Chat portal from our website to chat with the experts and get ideas online while sitting at home. In addition, you can also email us and our technical executives will address your query in no time.